PennsylvAsia: "ASA Culture Fair: Journey to the East" at Pitt, December 2. 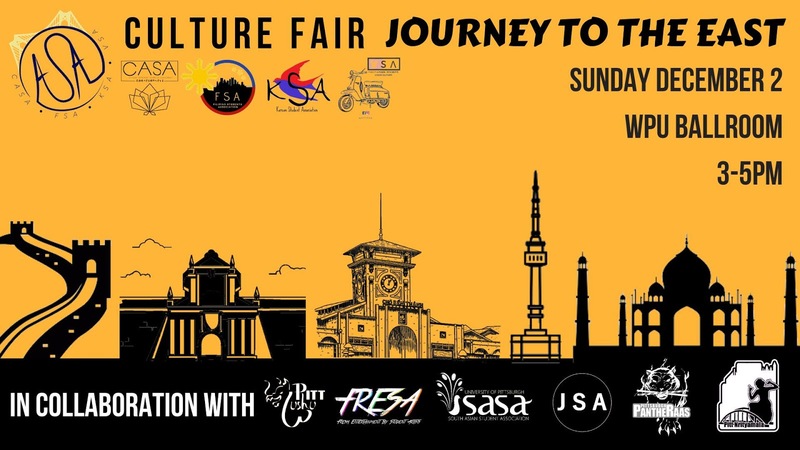 "ASA Culture Fair: Journey to the East" at Pitt, December 2. The University of Pittsburgh's Asian Students Alliance, in collaboration with numerous other on-campus organizations, will present the ASA Culture Fair on December 2. The Asian Students Alliance alongside the umbrellas the Chinese American Students Association, Filipino Students Association, Korean Student Association and the Vietnamese Student Association are proud to present Culture Fair: Journey to the East. In collaboration with Pitt Wushu, FRESA, SASA, JSA, PantheRaas and Pitt Nrityamala, we invite you to join us for an afternoon of performances, games and FREE FOOD. On Sunday December 2nd we will take you along on our Journey to the East. Catch a glimpse of each participating orgs culture; indulge in delicious dishes from all around Asia and engage in countless games and activities. It runs from 3:00 to 5:00 pm in the William Pitt Union's Ballroom.